If you ride the trails in greater Willistown, please take our Equestrian Trails User Survey. Besides its abundance of over 7,200 acres of countryside permanently protected from development, Willistown has long been known for its lovely network of trails, consisting of both eased (permanently protected) and uneased equestrian and pedestrian trails. In October of 2012, the “Willistown Trails Team” was formally created as a subcommittee of the Trust’s Land Protection committee. With the support of the community, the Trails Team Subcommittee is committed to assuring the ultimate connectivity and preservation of our precious trail network. Its goals are to (1) identify and map critical equestrian and pedestrian trail corridors within the Trust’s program area; (2) develop strategies for acquiring trail easements on currently unprotected trails; and (3) coordinate with landowners to improve access to, and maintenance of, both protected and unprotected trails. The Trails Team continues the good work of the Willistown Area Trails Association (WATA) and is staffed by volunteers who are a hardworking group of land conservation advocates, foxhunters, recreational riders, and outdoors lovers. To get more information on how you can support the Trails Team, send email to land@wctrust.org. Trail maps are available for each of our nature preserves. The first principles of keeping our trails open to riders are respect, thoughtfulness, and safety. Because many of our trails are on private property, we enjoy them as long as we keep the goodwill of the landowners, and the thoughtless act of one or a few riders CAN and HAS closed properties to everyone. Landowners graciously allow the use of their trails with no recompense. Riders should cherish this privilege. If you meet a landowner, DO say hello and express your appreciation for the beauty of his or her land and thanks for the privilege of enjoying it. If you see other riders going where they are not welcome, or where the turf is too soft, please remind them politely but urgently that they are putting the riding privileges of all of us in jeopardy. The Trails Team is working on ways to show appreciation to landowners; please participate in these activities or feel free to suggest others to us. Our goal is to maintain and to build on the Willistown area’s legacy as a community of generous landowners and appreciative horse people who share the bond of their love of this country. Rainfall seems to be coming to us in increasingly heavy amounts. Many of our trails and paths are vulnerable to damage for at least several days after a big rain. When our trails are in soggy condition, please stay in the ring, or on dirt roads—Warren Ave., Plumsock, or Green Lane. Some fields where drainage is good and turf is well established and dense can withstand hoof traffic sooner than shady areas. Please pay close attention to whether your horse is leaving deep hoof prints such as you might not like to see in your own yard. Our predecessors, the people of WATA (Willistown Area Trails Association), were able to preserve much of our trail network by attending planning meetings when farms and riding country was subdivided and requesting and obtaining equestrian passageways through developments. Some of our trail network now goes through subdivisions and on suburban streets and driveways. A pile of manure somehow looks different in these settings than on a dirt road or woods trail. If your horse leaves manure in a place where it might give offense, or you see that someone else’s horse has done this, please help equestrians look good by coming back to clean it up. Please walk by pastured animals, and leave gates they way you find them-open or closed. Recreational pleasure riding is among the most statistically dangerous sports activities and accounts for more accidents than many more apparently violent and dangerous activities such as football, skydiving and white water rafting. Most riders in our area are aware of the importance of wearing an approved helmet. Traumatic head injuries account for 60% of deaths and almost 20% of all injuries in equestrian accidents. Helmets are estimated to reduce traumatic brain injuries by 88%. For that reason, equestrian property owners’ insurance requires that helmets be worn when mounted. Equestrians can be barred from public lands if they cause damage and / or endanger other users. Private landowners also do not like the idea of accidents occurring on their land. If you are not completely confident in your ability to control your horse in a variety of situations, stay on your own farm or your horse’s boarding stable’s property. Our beloved dogs are unfortunately a major source of friction with landowners and of accidents to riders, and must be left at home. We depend on volunteers for most of our trail work, and hope that those who love our riding country will want to help maintain it. In the past, trail work has mostly consisted of brush clearing or clearing fallen trees blocking trails. The Trails Team would like to do more work to improve the condition of the tread way of certain trails– both eroded ones and boggy ones. Many of our trails are “user generated” rather than planned, and go through bogs and wetlands; some cannot be re-routed, and the conditions of some boggy areas have worsened with the intense rains we have been having in recent years. Other formerly very good, rideable trails have had portions of their treadways scoured out by the action of water. If you are interested in participating in a trail clearing or trail tread way improvement project, please get in touch at land@wctrust.org and get on our trail projects email list if you haven’t done so yet. Let us know if you have a chain saw, weed whacker, a hedge trimmer, a Pulaski, a McCloud, a Rogue hoe, a dump truck, good loppers, a strong back, or any other assets that might be useful. Please also email us with suggestions for trails you’d like to see cleared or improved. For clearing days wear thorn-proof clothes and gloves and good mud shoes. We offer good exercise and camaraderie, natural beauty, and a satisfying sense of accomplishment about making Willistown’s natural beauty more accessible. Trail work has usually been done on Sunday afternoons. Let us know if you’d rather be on a list for occasional weekday projects. Please ride just the perimeter of the field, including from the water wheel along the bottom to the farm road that goes by the farm to Dutton Mill Rd., and right along the fence up to the woods. We have been asked NOT ride the old path across the middle of the field. Where the trail from Brushwood woods comes out below the steepest part of the hill, go either up the hill or down, staying along the perimeter. Going toward or coming from Okehocking, riders should not dismount to open the driveway gate; they should push the button designed for riders on the 4 X 4 posts on either side. Please observe the signs posted at Turtle Rock Farm . The owners are asking us to refrain from riding on the middle portion of the gravel driveway, curve to curve. Our horses’ hooves damage the driveway, and contribute to washout during storms. Cross over as needed at either end of the gravel drive, and ride on the grass as you parallel the creek. 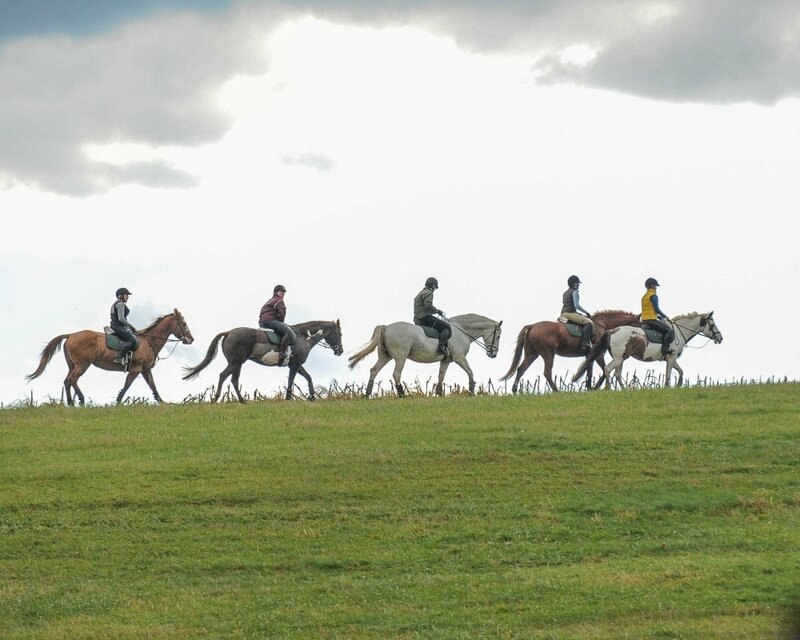 The trail from Okehocking through Turtle Rock Farm is equestrian only. Pedestrians are not permitted to walk through the farm to Garrett Mill Rd. The Trails Team is planning a way across Ridley Creek south of the farm, connecting Okehocking to Garrett Mill Rd., Garrett Mill Park, and trails in that area. June 2015: the path that runs through the middle of the cornfield has just been planted with corn, so riders are requested to stay off. There is still a way around this field in both directions, as should be indicated by signs. June 2015: The new owners of Ohana Farm on Warren Ave. (the former Creighton Farm) would like riders NOT to come through the property while they are figuring out their master plan for these 80 acres, and while construction projects are under way. They ultimately do envision trails all around and through the area when the work is finished. We wish them luck! In general keep well away from houses and buildings wherever possible. People inside houses have complained of being disturbed by riders talking loudly on cell phones! If you must talk on the phone while riding, please do so as quietly and discreetly as possible. You may not be alone! In wet weather, stay on dirt roads—dirt Warren, Plumsock, or Green Lane—or stay in the ring. 1. Is there a map of the trails we are allowed to ride? I know several trails, but I’d like to know more, and I don’t want to trespass. We have trail maps of all of our preserves available on our web site. We do not distribute maps of the trails that are on private property to respect the privacy and security of the landowners. We have a number of volunteers who know the country well and would love to show you the various parts of our country. Send us an email (land@wctrust.org) letting us know where you are located, where you might like to go (e.g., “How do I get to Okehocking? Or Willisbrook Preserve. Or just, “I’d like to see some new trails”) and what days or times are best, and we’ll match you with someone who can show you some great rides, and may just become your new best riding buddy. 2. What is a trail easement? A trail easement is a legal document attached to a parcel of land that allocates part of it to be dedicated for trail usage. The easement stays with the land; i.e., all future owners of the land must keep the trail open and available for trail users as specified in the easement document. 3. What is a bridle path? A bridle path is a trail that runs alongside a road or street. Some bridle paths are eased, others are not eased but are open for trail riders to use.